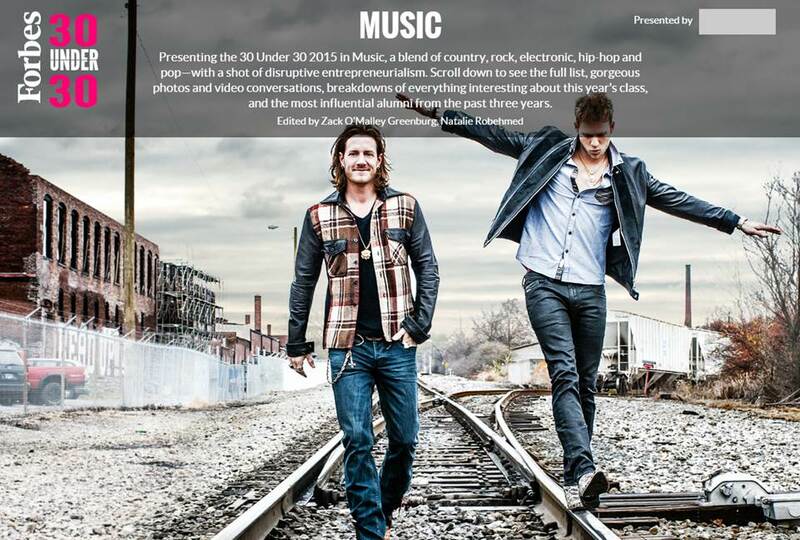 Huge congrats to FGL for leading the class of 2015 music in Forbes! Why? Because as one of the duo’s songs goes: “It’z Just What We Do.” Over the past three years Florida Georgia Line and its boozy, genre-bending brand of country (Lynyrd Skynyrd meets late-90s hip-hop) has propelled it from utter anonymity to mainstream stardom. Hubbard and Kelley met at Belmont University in Nashville, bonding over their love of country, rock and rap; they quickly launched a band named after the geographical boundary between their home states. Their smash single “Cruise” moved 8 million units in barely two years en route to becoming the most-downloaded country song of all time—and helped them earn $24 million last year—thanks partly to a remix featuring rapper Nelly. Their new album Anything Goes, with its rock and reggae-tinged songs, sold 197,000 copies its opening week. A portion of the above appears in the January 19th issue of FORBES magazine; the below is a Q&A from the same interview. FORBES: Florida Georgia Line–how’d it happen, and how did you get to where you are today? TYLER: I grew up loving music. Started in church, learning how to play guitar and fell in love with the creative process, songwriting, leading large groups of people, and doing our thing. And then we ended up meeting in Belmont University, here in Nashville, Tennessee, hit it off right away, started writing songs … that was in 2009. So we were just about to graduate college and didn’t exactly know what we wanted to do, but we knew we wanted to give this music thing a shot and travel the country in [Brian’s] Tahoe. And we had my enclosed trailer, and we just hit the road and tried to figure it out. We went out there and tried to make as many fans as possible, and one thing led to the next. And here we are. FORBES: You guys are definitely among the leaders in pushing the boundaries of country. What does country mean to you as a genre? And do you feel like there are necessarily boundaries on what constitutes a country song? BRIAN: I think country’s more of a lifestyle. … The music’s always going to evolve . The stories are always going to evolve. But I think it’s a combination of things. It’s a combination of the songs, the stories, the lifestyle. And it’s hard to put a name on country music. It’s hard to brand it. Everybody wants to put a name and label it a certain way. I think it’s all because we love it, because we take pride in it, because our lives have all been changed by country music. FORBES: Take me through a typical day on the road. TYLER: I’d say for us on the road, we like to seize the day. You never really know where you’re going to be. We wake up, see what city we’re in, wake up at a decent hour, get some coffee, a little breakfast, and get our head space right. And then maybe go to the gym, do something on our own, get away, have some alone time, whether that’s with our girls or just some alone time in the gym or riding a bicycle or riding a motorcycle or doing something outside and trying to get away, clear your mind a little bit. And then usually start a meet and greet around 6 or 7pm and have a little radio hang and start getting ready for the show and then trying to continue to get our mind right and get pumped up and get all the guys together. We do a ritual, and then we play the show. FORBES: Tell me about that ritual. TYLER HUBBARD: We get everybody that’s there at the show–friends, family, our band and crew, and get together in a circle and say a little chant. … Say a prayer, and then a shot of Fireball, get pumped up, and hit the stage. BRIAN KELLEY: Saturday night, maybe another shot of Fireball. Who knows. FORBES: Onto the lightning round. Best day of your life so far? BRIAN: That is hard to say. We’ve had a lot of good days. I think one of the best days of our life was when we signed our publishing deal and we knew we could write songs for a living and that could be our only focus and not have to take a lot of side jobs to pay the bills. And that was a pretty good day for us early on in our career. BRIAN: I’m extremely proud of my wife and our dogs and the family that we’re starting to build. We’ve got a cool little piece of land. The success in music is great. Tyler and I are not going to let that define us, we want to let it motivate us. But I think it’s cool becoming a man and growing up and having some things and waking up and having somebody that you want to continue to impress and work hard for and support. FORBES: All right. Best advice you’ve ever received? BRIAN: Larry the Cable Guy gave you some, didn’t he? That one time? TYLER: Yeah, “Get ‘er done!” I think just to be ourselves. And I think that’s important for anybody that’s in the creative spot. You want to be original, you want to be yourself, and whether that’s accepted or not accepted, that’s not as important as being you, being real, being creative, and being original. And finding your influences and putting it together to come up with something that’s different, something that is you. And we’ve always felt that that was a very big priority to us. BRIAN: I got some real good advice at Belmont University from my songwriting class. We had a guest speaker, Don Schlitz come in. He’s a Hall of Fame songwriter. And he said, “ There’s a song in every conversation. All you have to do is listen. ” And I shared that with Tyler right when we started hanging out. … We’ve taken that, the past couple years, any chance we get to write a title or in our notes in our phone or sing a melody or whatever, you never know what it’s going to sound like. FORBES: What did you want to do as a kid, and what would you have done if you hadn’t done what you’re doing now? BRIAN: I think as a kid, a firefighter, and then a Major League Baseball player for probably the longest time all through college. And that didn’t work out. And if this music thing didn’t work out, probably still be in Nashville trying to figure out how to write songs. That was plan A, B, C, D, E, F, G.
TYLER: I enjoyed racing motocross as a kid. So maybe be doing that. Maybe be in the health and fitness world. I don’t really know, to be honest. But music was plan A, B, and C, for sure. FORBES: What’s one decision that changed your life? TYLER: To move to Nashville. … That’s early on, but if we hadn’t have been in Nashville, we wouldn’t have met each other and we probably wouldn’t be doing music. No telling what we’d be doing. So yeah, I think taking that step and kind of the leap of faith and going on our own and moving to Nashville and chasing the crazy dream has got us where we’re at. FORBES: What are you most looking forward to in the future? BRIAN: Our world tour, 2015. We’re headed to the U.K., to Australia, all around the States, Canada I believe as well. Our fans have just been asking for this for such a long time. We’re getting to play longer, it’s our show, we’ve got Thomas Rhett, Frankie Ballard out with us, it’s going to be a non-stop party. It’s called the Anything Goes tour. FORBES: Being named to the 30 Under 30 list after guys like Bruno Mars and Wiz Khalifa, what will that mean to you? TYLER: It’s a huge honor to be named one of the 30 Under 30. For us, it’s something that if you’d asked us three years ago, we would’ve laughed at you. BRIAN: We were the negative 30 Under 30, actually. TYLER: Yeah, we had about negative $30 in our bank account about two years ago. I’m not really exaggerating. So for us, it’s a huge honor and it’s a testament to our fans, it’s a testament to country radio, it’s a testament to our team and the people that’s believed in us and helped us get here. There’s a lot of people behind the scenes, a lot of people that’s put in a lot of long hours to help us out and to get us here. BRIAN: Like Tyler said, it definitely is an honor … Forbes is one of those prestigious outlets, you feel like can’t touch it, you can’t get near it. It’s well respected, it’s big time. So it is an honor. Very, very surreal for us to be a part of anything Forbes. FORBES: Describe your work in three words. BRIAN: Fun. Authentic. Party. I can go all day, Tyler. TYLER: I’d say fast, for sure. Fast, fun, and you’ve got the next one, B.